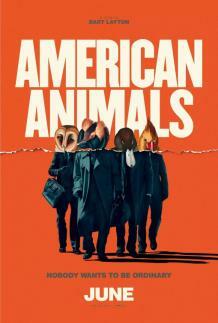 "You'd call this heist film unbleeping-believable, except that American Animals really is rooted in fact. It's 2004 in Lexington, Kentucky, when homeboys Spencer Reinhard (Barry Keoghan) and Warren Lipka (Evan Peters), students at local Transylvania University, decide to pull off a robbery. They don't need the money, not really. But right there at the school's special collections library sit original editions of John James Audubon's Birds of America, as well as Charles Darwin's On the Origin of the Species. How easy it would be, these American idiots think, to sneak these priceless literary landmarks past head librarian Betty Jean Gooch (a superb Ann Dowd, the punisher Aunt Lydia on The Handmaid's Tale) and sell them on the black market. "The plan is hatched. All that's left is to recruit two fellow students, Chas Allen (Blake Jenner) and Eric Borsuk (Jared Abrahamson), to carry them to the finish line. And, oh yeah, they need disguises, deciding to dress as old men in hats, coats, gray wigs and beards that fool no one. They deduce that final exam period is the best time to pull off their amateur robbery. They've already found an Amsterdam accomplice (Udo Kier) to fence the books and plenty of how-to inspiration by renting classic heist films (The Asphalt Jungle, The Killing, Rififi, Ocean's Eleven, The Italian Job) from the local Blockbuster. A nice touch, that.